After three years of anticipation for the Minnesota Vikings organization and local fans in Minnesota, the football team's new US Bank Stadium is finally here! 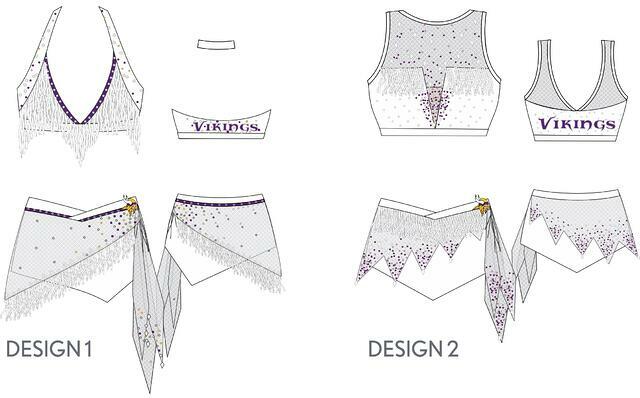 The Minnesota Vikings Cheerleaders (MVC) celebrated the stadium's inaugural season with some new digs of their own: a stunning new signature uniform! The team revealed their new look yesterday with a fabulous photo gallery on their website. Excitement has been running high at The Line Up - we've waited months to share MVC's custom cheer uniform with you! Read on for a sneak peek behind the scenes of the team's makeover! The final request was that the uniform be white, in order to pop on the field, pay compliment to the rest of the team's purple uniforms, and embrace the wintery concept behind the branding. 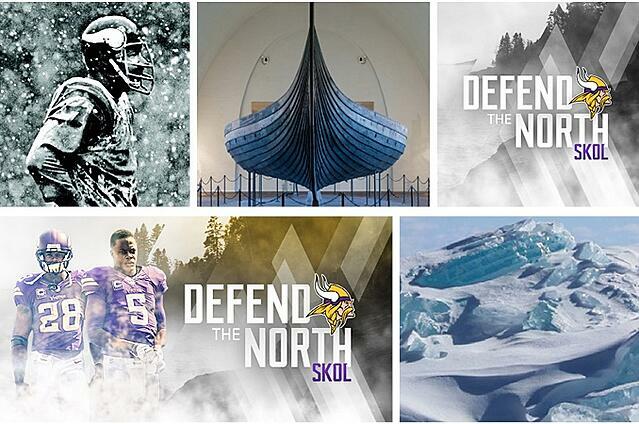 Inspiration images from the Vikings brand platform (top) , and a rendering of the stadium by HKS Architects (bottom). With these themes in mind, designers Michelle and Deb got to work. The team went through five rounds of design sketches before landing on two options. Sample prototypes of each option were created so Tami and the Vikings team could better visualize the final result. Deep V neckline, inspired by the structured angles of the stadium and use of v's in the branding graphics. Beaded fringe, inspired by the "capture the north" branding and icicles of a true Minnesota winter. Lots and lots of sparkle, this uniform has 2,400 heat transferred sequins and 1,500 rhinestones!!! White and silver dominate, with minimal purple and gold, to again ice and snow. Jagged skirt hem and "shield" dangles, referencing the Vikings shield and icicles. "[The uniform] was something different than they have normally done, but still went with the Vikings look," said Megan, account manager. "The white was a fresh new look, but the jagged skirt still fit with their other costumes." Before production could start, Deb and account manager Megan went over to the Vikings practice facility to fit the dancers. With over 40 uniforms, it was a big order! 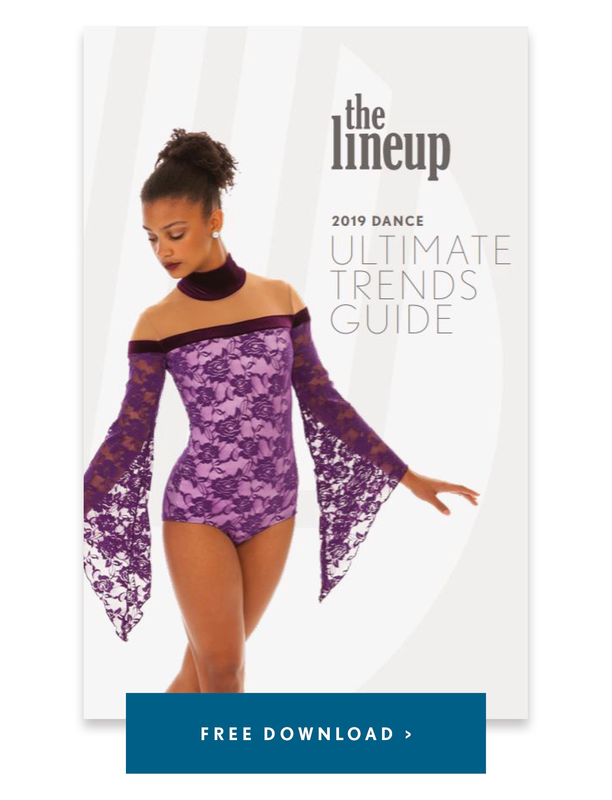 With so many different embellishments, Megan made sure the specialty fringe, fabric, and rhinestones were ordered well in advance to meet their August deadline. So much sparkle and detail meant a labor intensive production process. Each uniform took 5 hours to produce (that's 5 times longer than our average project!). The Vikings lettering was embroidered on the back. 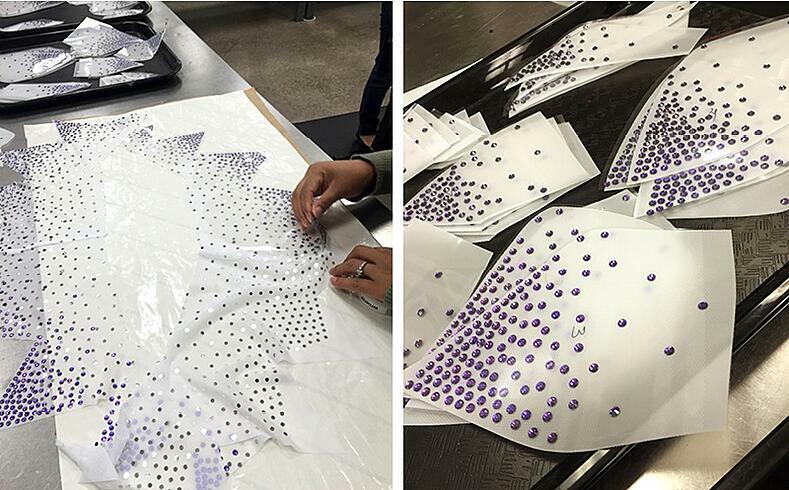 The sequins had to be heat transferred onto each pattern piece. Careful attention was paid to the delicate bead fringe during the sewing process. The purple rhinestones were both machine and hand applied for the final touch. All this added up to be one of our most expensive costumes to date! The top before all of the purple rhinestones were applied (above). The top in sewing (left), and in rhinestoning (right). The final result is an innovative uniform with one very strong theme: ICE! "The fun part about working with Tami and the Vikings is that we get to be creative and expand upon their look," said Deb, creative director at The Line Up. "They are always willing to try something new!" Throughout the process, Megan worked diligently to make sure the project was on track, so the uniforms could be delivered in time for their photo shoot. 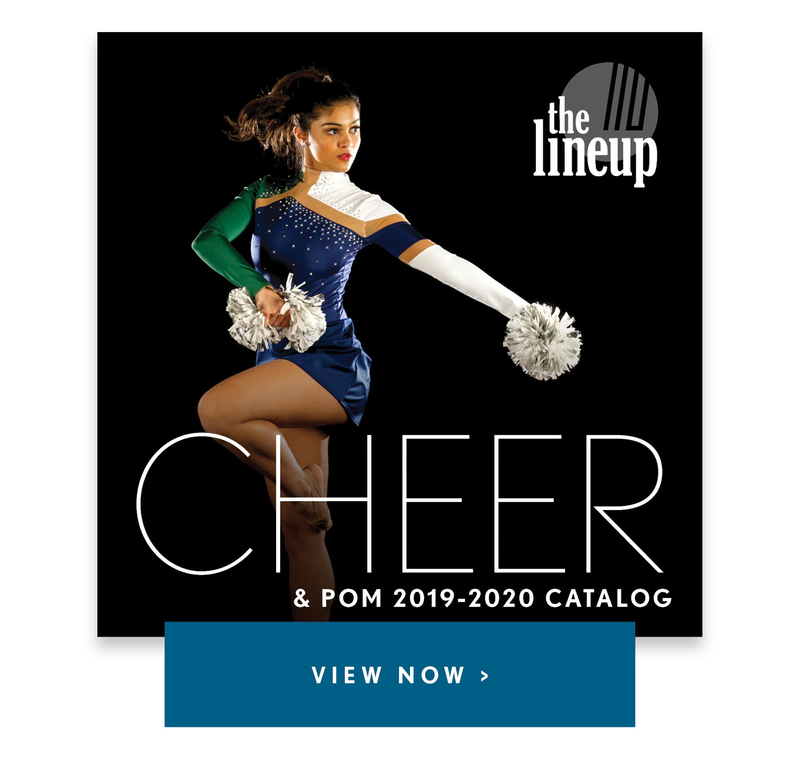 The stunning pictures from the shoot were debuted on their website yesterday, and featured the dancers in their new stadium. MVC likes to name each of their uniforms, and no one had to think twice about the name for this uniform - ICE, of course! 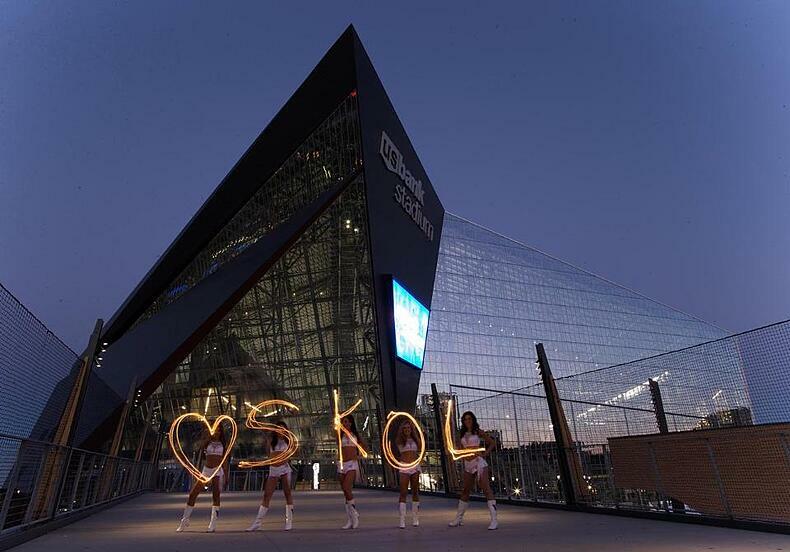 Congratulations Vikings on your new home - we hope to see you dancing in style for years to come! MVCs at practice, on the day they received their new uniforms (above)!